Count Calliope among those ancient names that feel fresh and modern today. Thanks to 1 Tim. 4:12 for suggesting our Baby Name of the Day, one of the newest names on the US Top 1000. We love musical names, from tried-and-true Melody to newcomer Aria. Calliope fits right in. In Greek, kallos means beauty, while ops refers to voice. This name translates to “beautiful voice” – just perfect for a singer. Back in the 1850s, inventor Joshua C. Stoddard dreamt up a new-fangled contraption meant to replace church bells. He gave it this musical name. The new-fangled music maker became a staple on river boats, carousels, and with the circus. Of course, those old-school calliopes could be loud, even shrill, which slightly shifts the way some the name. But I think it leans slightly vintage Americana. In modern Greece, this name is spelled Kalliopi, and the pronunciation is slightly different, with an ‘ee’ instead of an ‘eye’ sound. Fun fact: at least a few of those Kalliopis prefer the nickname Poppy. But most Americans probably think of antiquity. Calliope belongs to the Muses, the eldest of the group of goddesses responsible for art, literature, and the like. Homer credited her with inspiring the Iliad and the Odyssey. She turns up in other tales, and has several sons, including Orpheus and Linus. Both the Roman Catholic and Eastern Orthodox churches acknowledge a saint by the name, too. We know little about her life, but the story goes something like this: she rejected a pagan suitor or three. The authorities stepped in after one jealous suitor reported her. Calliope faced torture, and eventual death, at their hands. The saint explains the name’s ongoing use, even as many of the other Muses’ names have faded into obscurity. The smallest bird found in the US answers to this name; it belongs to the hummingbird family. A 1980s television show took this name; so have several ships of the Royal Navy. But the most notable appearance of this name occurs on the small screen. Grey’s Anatomy introduced Dr. Calliope Iphigenia Torres during season two. She appeared on the long-running series from 2006 through 2016. The character answers to Callie almost all the time, and yet, there’s an uptick in the longer name’s use. In 2006, just 35 girls received the name. By 2016, that number soared to 289 births, enough to crack the Top 1000. Another reason this name is rising? 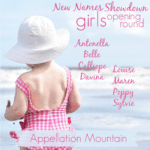 Credit Penelope, Zoe, Chloe, Phoebe, and all of those ends-with-e girl names so much in favor today. Despite so much history, this name never appeared in the US Top 1000. Not until 2016, with the popularity of those Greek girls’ names reaching new heights. It helps that Callie, Kali, and most of the other spellings rank well in the current US Top 1000, too. Overall, that makes this name a promising alternative to Penelope and her sisters. If you love this style, but want something less expected, this name could be for you. Originally published on April 8, 2009, this post was revised, updated, and re-posted on June 28, 2017. Felicia Day called her daughter, both earlier this year, Calliope Maeve. Such a pretty combination! Poppy is short for Calliope in Greece, which I think is beautiful 🙂 I don’t like Callie or Allie though. Ooh, I like Poppy as a nickname for this name. She still is Calliope and is 6 years old. Kids in school pronounce it correctly and she is definitely one of a kind 🙂 Some readers will say the cu-liaope pronounciation but reminding them usually corrects it quickly. Everyone loves the name and it is do easy to say and musical.. This is an interesting site I just happened to fall upon! 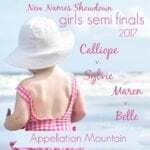 My name is Calliope …. and I go by Callie most of the time. I am greek and as tradition, greeks typically name their kids after the grandparents to honor them. So in a systmatic way I was besowed my grandmother’s name. Growing up I didn’t value the name chosen for me, mostly because pronunciation was a problem (which I still do a lot of correcting to this day). People like to sound it out as “Cu-LIE-YA-PEE”, when it should be pronounced “Cal-LEE-O-PEE”. None the less I grew up and was able to get over the pronunciation errors and appreciate my name. I get complimented on it frequently and people find it unusual … but unique and beautiful. I also get a lot of questions about my name. I usually go thru a quick synopsis of Calliope the muse, the saint and the definition of the word. But I also make note that Calliope was first and foremost my grandmother … and for this reason it is most beautiful to me. She was a huge role model, an inspiration and left her mark on me. I take great pride in trying to live up to my grandmother’s name now that I am older. In closing Calliope is a beautiful name and I have enjoyed being blessed with it. I would recommend it anyone when naming a child. 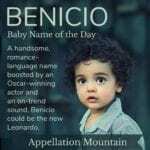 But one thing I would suggest considering when picking out a name … is not to choose one that rolls of the tongue nicely, but to choose one that inspires you from your family and loved ones! Someone that you would want the child to follow in their footsteps and emulate. That is where a name truly finds it meaning! Thanks for all the wonderful postings … I’ve thoroughly enjoyed browsing thru them all! I’m glad you all like the name. I personally have never had a nickname but my mother did contemplate calling me Lily before I was born. It combines the “li” sounds from my first and middle names, both belonging to each of my grandmothers. I, however, was a very stubborn child who refused to be called Callie when I entered kindergarten and I’ve gone by my full name ever since. If any of you are considering naming your daughter Kalliopi, I would highly recommend that you don’t shorten it. Though I couldn’t have known it at the age of 5, it was one of the best decisions I’ve ever made. It’s a bold name that leaves a lasting impression. I love your name Aristea. It’s beautiful. I also like Popi. It never occurred to me. We’ll try it out and see how it fits. The people at our bank can’t get her name right, they always call her Penelope. lol. Another nickname for Calliope is Popi, but that could also be short for Penelope so maybe not as original. To the last post Mia – Mother of Calliope I can sympathise with you when people dont’ make an effort to pronounce your name properly. My Greek name is Aristea (pronounced as seen Ah-ris-teh -ah) and I get Ah ris tee… which I dislike alot… oh well.. and if anyone is curious as to the meaning it comes from my grandpa Aristeides which means the best kind. I am so happy to see all you lovers of this wonderful name. I named my newborn daughter Calliope (Calliope Rose Dean) on March 25th, 2009. It was my dream name and though I had a hard time convincing the rest of the family on it, eventually they all came around. So far, we are not shortening her name, I have no intention of ever shortening it, though my relatives have been referring to her as Callie-Rose, which I like much better than Callie. I must admit, at the doctors office , most of the nurses and doctors have had a hard time figuring out how to pronounce it, but there are nothing but complements on the name one the pronunciation has be established. My dad picked this for my little sister’s name. I talked him out of it. I thought it was hard to spell and did not have an obvious pronunciation. (I was seven at the time.) I still think of a kindergartener struggling to master spelling her name and explaining how to pronounce it. It’s a pretty enough name and my sister doesn’t like the one she wound up with; perhaps I was wrong. I love Calliope, but am not a fan of the inevitable diminutive Callie. Calliope is pretty! I had a friend in college who used to joke about using strange words for her kids’ middle names. I don’t remember all of them, but she liked the sound of Clock for a boy’s middle and Calliope for a girl. Maybe I’ll have to tell her that Calliope isn’t so far out there! Doh – and Clio would work too! And that’s a great nn. I love Calla – that’s fantastic… never ocurred to me, but I really like it! Hmmm, Calliope is growing on me. Lola, I was going to timidly suggest Calla, so I’m glad you thought of it first! Calla is a sort of guilty pleasure of mine–I love the lily association and the meaning, but the sound is too flimsy for me. Calliope has more weight and I’ve always liked it. Hmmmm! Thanks for your suggestions, guys. I really like Lea, Leo, and Calla. I want to smack myself for not thinking of it too, Lola! The toilet and book associations are a bit unsavory, but I’m still resolute in my love of the name! 1) In Greece, Kalliopi/Calliope is slang for toilet. That’s probably why Ms. Saratsopoulou goes by Kelly. 2) Many people will associate this with the protagonist of _Middlesex_ by Jeffrey Eugenides, the story of a hermaphrodite who began life as Calliope but grew later to be known as Cal. Neither association is a necessary dealbreaker, but I do hope others are brave enough to choose this luscious name! Just a thought, but for the alternative nickname, Allie/Ali/Ally is possible if you pronounce the full as kal EE oh pee. Much like Callie, I’m not big on Allie, but sometimes just one letter or one sound can make a big difference for some. Also Lee, Leo (I know a Leonie who goes by Leo) and maybe even Lea could work – I know it’s an “oh” sound, but Lea is more inherently feminine sounding than Leo. What do you all think? Thank you for covering this one. I really love Calliope, with it’s melodic sound, and its connections to Greek myth (which I am obsessed with.) It also has a cool meaning, which can’t be said for all pretty Greek name (I’m looking at you, Persephone!) I’m also excited that you found the Saint connection, which would make me feel less guilty to use it on a hypothetical daughter! The whistle connection doesn’t bother me compared to all of its pluses. But I don’t really like Callie either, as it sounds similar to the Kaylee/Kylie/Kayla craze…I’m looking for a more attractive nickname. Any suggestions? I toy with Calliope as a middle for more solid, serious choices but in the end, I like it but not enough to actually use it. Calypso is more likely to end up in the middle for me. I dislike Callie, really. I find it horsey and rough. No offense to any Callie’s out there, honest, I have no problem with Callie on anyone else’s kid. For myself, I much prefer Penelope. I find it more of a classic. Like JNE, I would be pleasantly surprised to find Callie short for Calliope! Calliope’s awesome in full and if there was any nickname beyond Callie that I could get out of it, I’d consider it more in depth for myself. But the fact reamins, Calliope itself is gorgeous, I’d love to meet a few! I like Calliope. It’s not a favorite, but it is nice. It seems less uncommon to me than it actually is, probably due to the heavier use of the Callie nickname and maybe partly because I’ve known a Kalliope. Still, I think it’s a name that wears well and has a nice melody when said aloud and it has a nice history. I tend to prefer the similar-ending Penelope, but only slightly. In aaddition to the reasons Verity mentions, the rise in popularity of Penelope might also indicate that Calliope is ripe for gaining too. 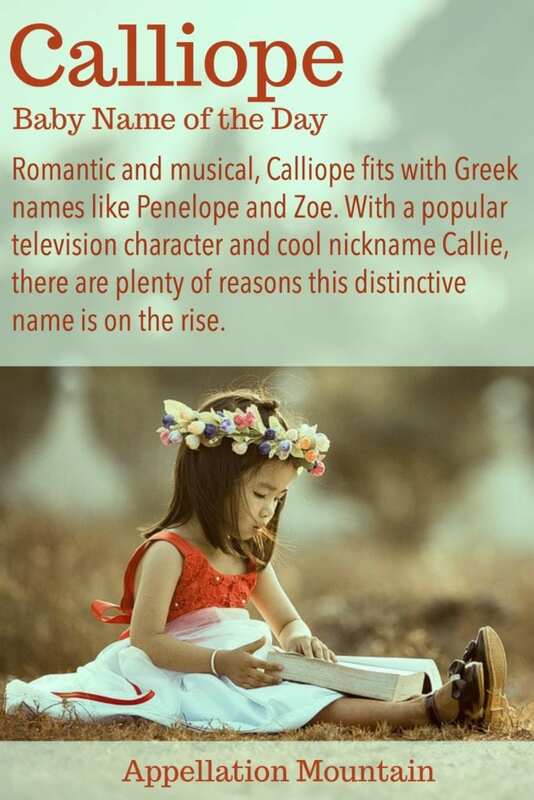 I’d certainly find it fun to run across a little Callie whose name was short for the full Calliope.